LEE -- Train wreck specialists began working yesterday to recover nine derailed freight cars that jumped their tracks late Monday night, sending two crashing into the adjacent Housatonic River. Seven other freight cars on the 57-car, three-locomotive train were either tipped on their sides or leaning precariously alongside the mangled train tracks, just north of Schweitzer-Mauduit's Columbia Mill. The tracks are owned by Housatonic Railroad Co. of Canaan, Conn., which also runs the trains on the rails between Pittsfield and Canaan. The cause of the crash now appears to be a sharp flange attached to a train wheel, which malfunctioned at the switching area near Columbia Mill, said Matthew Boardman, project manager for the railroad company, late yesterday afternoon. It's not clear to which car the bad wheel was attached, he said. 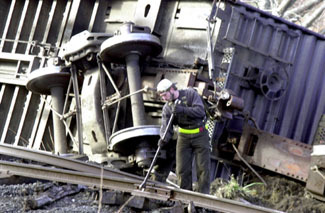 A worker unbolts a piece of twisted track during yesterday's cleanup operation. Railroad officials expect the site to be cleared by tonight. Yesterday morning, the two intact boxcars sat in the river, about 7 feet below the tracks, with their loads of plywood apparently just waterlogged. Another car was leaning precariously toward the river, loaded with plastic resin pellets bound for Sheffield Plastics in Sheffield, said Robert Bass, the railroad company's general manager. A number of the other derailed cars were empty, he said. About 150 feet of track were ripped apart, and late Monday night the ties were strewn about and rails were poking toward the sky. Immediately after the crash Monday, the wrecked cars were lying eerily in the dark night, with no police or other security to keep the curious from poking about the stray train wheels, mangled tracks and strewn rail ties. 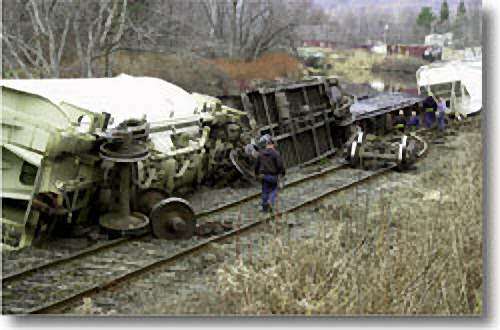 The derailment involved cars that were about 10 or 11 places behind the first locomotive. The cars in front and behind were still on the tracks. Bass was at the scene yesterday with a cell phone, radio and hard hat, overseeing recovery work being done by a Newburgh, N.Y., derailment company. He said he hoped an inspection would reveal what happened. "All we know is that about 10:30 last night [Monday] the engineer reported that the train went into emergency," he said. All the cars are connected with a hydraulic air line that controls the brakes, he said. When the line breaks, the train stops. "Every derailment is different. You can have the best track in the country and a derailment can happen and rip the tracks to shreds," he said. He predicted that the derailed cars would be cleared and the tracks repaired by tonight. Edward Rodriguez, executive vice president for Housatonic Railroad in Canaan, said in a telephone interview that the tracks in the area have been maintained regularly. The train speed limit through Lee is 10 mph. The locomotive's trip recorder found that the train was going 9 mph when the accident occurred, he said, and the engineer followed proper procedures in responding to the accident. David Rushton, materials manager for Sheffield Plastics, was also in Lee yesterday, observing the recovery operation. His company had about $1 million worth of resin pellets in five of the train cars. Each of the five carloads was carrying about 180,000 pounds, or $200,000 worth, of pellets. Once the most unstable cars were righted, the company began unloading the contents into a truck for delivery to Sheffield. Earlier in the day, he said he was assured that the most worrisome, tipping car was intact, and that the pellets were in no danger of spilling into the river. Even so, some precautions were taken to contain any materials that might escape the train car, he said. Sheffield Plastics sent him to Lee to make sure the recovery effort is environmentally sound, he said. "Last we heard, everything was contained," said a dispatcher at the Canaan freight yard at about 4:30 yesterday. Boardman said it's not unusual for train cars to carry hazardous materials, such as acid or oil-based products. In Monday's incident, no such substances were involved, he said. Yesterday morning, a string of onlookers in jeans and baseball caps, among them some retirees and a grandfather with a toddler in his arms, lined the nearby roadway to watch as giant steel cables were wrapped around one of the pellet-loaded cars that was leaning west. The cables were attached to squat bulldozers with winches, which around noon began hauling up the tipping car carrying pellets. In seconds, the car was mostly upright, though still off the tracks. George Davenport and his wife, Sharon, came from their house on Bradley Street nearby. Sharon Davenport had planned to clean her house yesterday, but a train wreck was too good to pass up. "This is the most exciting thing that's happened since Santa Claus came to town," said her husband. Rodriguez said the last time a train derailed on the Housatonic tracks was in Lee in December 1999. In that accident, which was caused by a bad rod on the track, no trains tipped over.